Deep Purple History: It was here that "Highway Star" was first performed live. 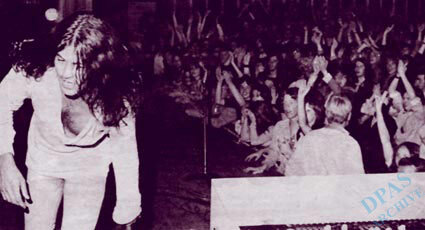 The Details: Deep Purple began their Autumn 1971 UK tour in Portsmouth. A coach was hired to take the band, invited journalists and photographers to the show. On the way one journalist asked Ian Gillan how the band wrote their songs. Glover began bashing out a new tune they'd been working on, gave Gillan a title and Gillan began ad-libbing words on the spot. They rehearsed it before the show and "Highway Star" made it's debut at Portsmouth Guildhall on Sept 13th 1971. The picture here shows Gillan racing off the stage that night. The band had played the Guidhall for the first time earlier that year, February 9th 1971, on their final "In Rock" tour. They played the hall again on August 19th 1972 on the "Machine Head" tour, and once more on February 23rd 1973 during Mk 2's short final UK tour. The group included the venue next on their extensive 1996 Purpendicular tour twenty three years later, and played at the venue again in September 2002. 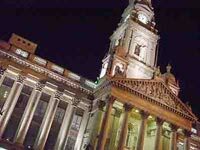 Today: Portsmouth Guildhall still hosts a variety of live entertainment. Although the exterior is very much muncipal town hall architecture in the classical tradition, the interior is quite art deco in feel. Getting there: The Guidhall is centrally sited in a pedestrianised square in the middle of Portsmouth.